How Can I Go Air Salon & Blow Dry Bar? 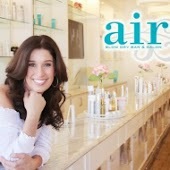 Where is Air Salon & Blow Dry Bar in Baton Rouge on the Map? I have been coming to Air on and off since they first opened their BR salon and I absolutely love it. There are very few things I can justify splurging on - but Air is definitely one of them. Everyone from the front desk to the stylists are sweet, personable, and professional - they're quick to offer water, coffee, or a mimosa when they check you in for your appointment. If you like a very zen, calm salon, Air might not be your top pick, but I love that all the stylists are very friendly and often stop to take a look at what their colleagues are doing and offer compliments. I recently decided to go for the "big chop" and cut my shoulder length hair into a pixie cut, and my stylist Melisa was with me every step of the way - for a consultation and for the actual cut. She did a phenomenal job and I'm so glad I had a stylist I could trust for such a big change. She took all of my needs into account and carefully referred back to my reference pictures throughout the cut so that she could make sure it would turn out the way I wanted it to. Not to mention that she was a total sweetheart and made me feel so much more confident about cutting all my hair off! Bottom line: come here to be pampered, listened to, and taken care of. Their blowouts are luxurious and everyone is friendly! Hillary did an amazing job!!! She achieved the exact color I wanted without compromising my hair. I asked her for recommendations on how I could get my hair healthier and she only recommended products she actually used on herself. She's super personable and very trustworthy!! Braylin did my hair and makeup for a Mardi Gras Ball. It was PHENOMENAL!!!!! So many compliments!!! Thank you!!!!! Air Bar never disappoints. Love this place and the staff is super friendly! Im almost there on a weekly basis. What a great way to pamper yourself! I tell all my friends to go there. A great place to unwind. From the moment you step into the shop you are treated like royalty. You thought you came in for just a great haircut. You also receive such wonderful service and delightful conversation. The furniture is comfortable and relaxing. You are sent email reminders and phone calls. Lydia has been cutting my hair for years.